Ian Gillan leads an all-star band for charity. In 1983, after the departure of Ronnie James Dio, Deep Purple singer Ian Gillan joined forces with Tony Iommi, Geezer Butler and Bill Ward to record Born Again, the first — and only — Black Sabbath album to feature Gillan's vocals. Despite its short-lived status, that Sabbath lineup has a cult following among fans. Fast forward to the end of the 1980s when tragedy struck the Spitak region of Armenia in the form of an earthquake. Gillan, along with Deep Purple band mate, Ritchie Blackmore and an all-star cast including Tony Iommi, David Gilmour, Bruce Dickinson, Brian May and Roger Taylor recorded an updated version of "Smoke On The Water" as part of the Rock Aid Armenia album to raise money for the region. Now, some 20 years later, Gillan, Iommi and a new all-star band have recorded a single to help the charity. 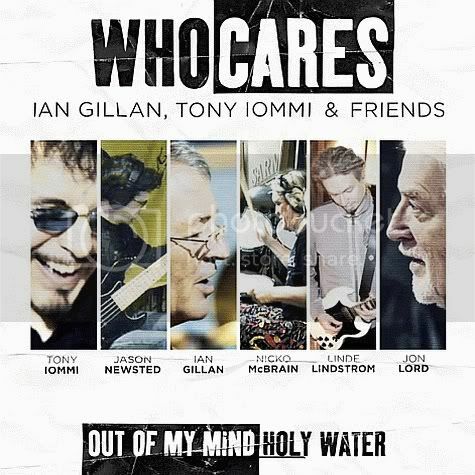 The project is called WhoCares and features Gillan on vocals, Iommi and Linde Lindstrom on guitar. Jason Newsted on bass, Jon Lord on keyboards and Nicko McBrain on drums. The result of this collaboration is "Out Of My Mind," a mid-tempo track that starts with an ominous, swampy guitar and bass intro before slamming into the song's main riff. The song would be at home on Heaven and Hell's album, The Devil You Know, but also has elements of Deep Purple from Lord's organ playing as well as a touch of Zeppelin (Think a heavier "Kashmir"). The song's bridge sounds as if it could have been lifted from an Ozzy Osbourne song, but the solo is unmistakably Iommi — a strong track all around. The CD's other track is "Holy Water," a track that only features Gillan and Iommi from the previous track's lineup, but includes a duduk intro from Ara Gevorgyan and a duduk solo from Arshak Sahakyan. The duduk is an Armenian instrument and gives the song some of the country's local flavor. The track is a ballad and features a fine, if restrained vocal from Gillan. He's singing to suit the song and it works perfectly. Also included on the CD is the music video for "Out Of My Mind" as well as a 27-minute documentary about Gillan's visits to Armenia over the years, including footage of him playing with the Armenian Philharmonic Orchestra. The documentary gives some background as to Gillan's interest in the charity as well. Gillan and Iommi have hinted that they may work on more music together. This is welcome news as "Out Of My Mind" demonstrates that they still have a strong writing chemistry together.